According to a Haaretz article (full text below), the Israel Museum announced yesterday that it was joining the Google Art Project, a venture designed to make the holdings of major museums around the world more accessible on-line through virtual visits. UPDATE #2 / 05 APR: Todd Bolen posts that the Israel Museum section of the Google Art Project is actually up and running and well worth a look. Thanks to the Israel Museum’s inclusion in the internet giant’s art venture, online users will be able to view high-resolution images of 520 pieces from the museum’s collection. Art connoisseurs around the globe will find it easier to visit Israel Museum, after the Jerusalem institute announced on Tuesday it was joining the Google Art Project, which provides online tours of the world’s top museums. The addition of Israel’s preeminent museum to the digital project was announced in a press conference participated by Culture and Sports Minister Limor Livnat. Thanks to the Israel Museum’s inclusion in the Google Art Project, online users will be able to view high-resolution images of 520 pieces from the museum’s collection. Among the works made available online are Monet’s water lilies; a Bronze-Era figurine of the god Reshef; as well as a 9,000-year-old Neolithic stone mask, one of the oldest to have ever been found. The Google Art Project was launched in 2011, and, at first, included a limited number of international museums. This year, the internet giant decided to expand the project, adding many more museums as well as galleries. At this point, the project includes 151 partners in Europe, the Americas, Asia, and Africa, featuring works from such museums as the Metropolitan Museum of Art, the Van Gogh Museum, and many more. 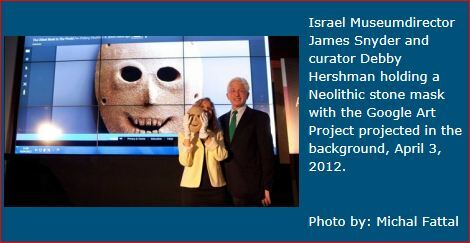 This entry was posted in Antiquities, Dead Sea Scrolls, Israel Museum, JERUSALEM, Photography, Resources and tagged Google Art Project, Israel Museum, Jerusalem, museums. Bookmark the permalink.